Dear friends and followers alike! Today I bring you PART 3 of my "Whisky-honeymoon" (sharing the whisky-related adventures that took place during the honeymoon me and my wife had in the beginning of this summer). For part one please click here. And yes, you are correct in noticing that part two, our visit to Bowmore Distillery has so far not yet been published, simmer down, it will come later (strangely enough, not very chronological ;) ). 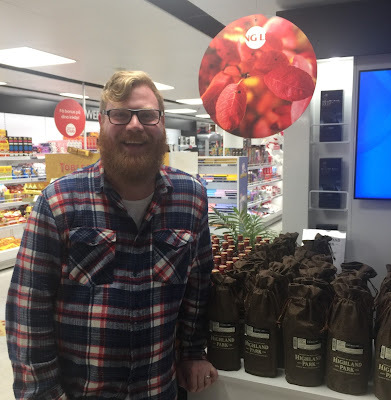 Anyways, as you might remember from part one, before going to Islay my wife and I spent one night in Glasgow, and it was there that we more or less randomly bumped in to Martin Markvardsen (Senior Brand Ambassador at Highland Park) who turned out to accidentally be in Glasgow due to some travel-trouble. We joined Martin (and Vicky) at the Pot Still bar for some beers and whisky during which we told them that after Islay we were heading to Edinburgh, and guess what, so was Martin! While we were going there to do some touristing, he was going there to do four tastings (at the Waldorf Astoria Edinburgh – The Caledonian) for RebusFest30; a weekend of literature, art, film and music that celebrated 30 years of Ian Rankins iconic fictional detective John Rebus (read more about it here). Being very friendly and generous Martin told us that we were more than welcome to stop by and join him during one of the tastings! Jippie! 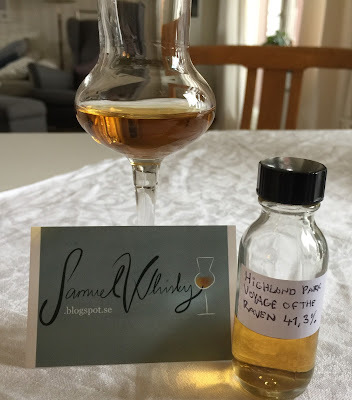 Since I had already tasted HP 12yo and HP 18yo a number of times and on a number of occasions, I decided to focus solely on Rebus30 and Valkyrie during the tasting and therefor did tasting notes only of them. 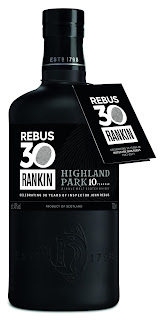 The liquid in Rebus30 is the same as in the regular HP 10yo meaning, what separates the two is the presentation/the bottle itself. Increadibly creamy, lots of vanilla, in fact a very peaty-sugary/sweet/fruity/fudge-y kind of vanilla. Just a wee touch of yeast (wash) in here. The fruits are candy-peach, banana-something, medium ripe pear, and sugar syrup with lime juice. The peatyness is so smooth and absolutely soaked with soft but kind of fat vanilla. Concluding from the nose, a majority of the liquid in this one must have been matured in american oak sherry casks rather than european oak sherry casks. Definitely starts off creamy! In fact, increadibly creamy, together with peach candy and overripe banana and/or banana jelly candy. Then some saltyness takes over, quickly moving on into a peaty spicyness. Medium dry or even very dry in the aftertaste. The creamyness in the beginning is very rich on vanilla and some banana jelly candy, but the main focus in the taste is definitely the peaty spice-yness. Great dram, and not as "simple" in style as I had thought it would be. 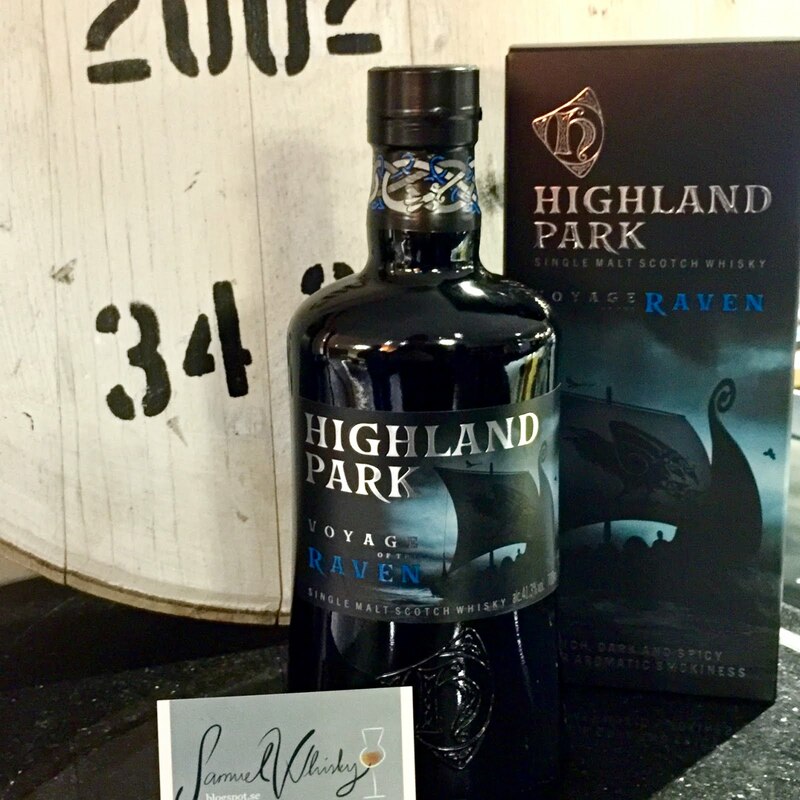 Valkyrie is the first release in a series of three whiskies, each one of them telling a Viking Legend. The story of Valkyrie goes: "Plunging down from the dark heavens, the Valkyries would descend like avenging angels on horseback to comb the battlefields for the bravest of the fallen warriors, heroes fit to enter the great Norse god Odin’s hall, Valhalla" (please feel free to read more about it here). Here in Sweden Valkyrie will be released at the state-monopoly tomorrow (view the product by clicking here). 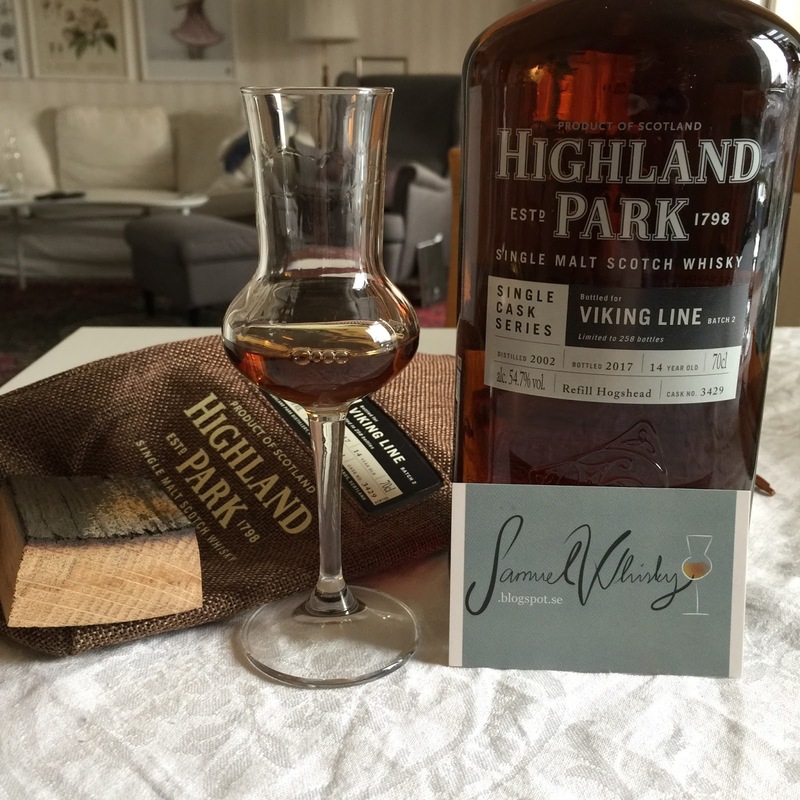 Now, from a whisky point of view, what sets Valkyrie apart from the "regular" HP-range? Well, it's the fact that it's peatier! In what way? Half of the whisky in the mix consists of whisky made from their heavily peated recipe, meaning made only from their own produced 45 ppm malt. The rest of the content consists of their "usual" recipe; made through mixing their 45 ppm malt (1 part) with the 0ppm malt (4 parts) they order from Simpsons Malting. 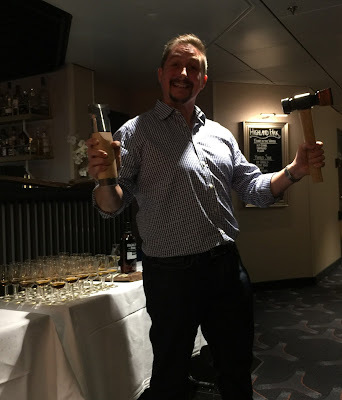 For recipe in terms of the composition of casks for Valkyrie please do take a look at this video (from 5:50 minutes and onward) with Gordon Motion (Master Whisky Maker at Highland Park). Now what Gordon does not tell us in the video is the ages that went into Valkyrie. However, do not despair, during the tasting Martin told us the following: the 45ppm part is between 8-10yo, and the rest of the whisky is 17yo at it's oldest. 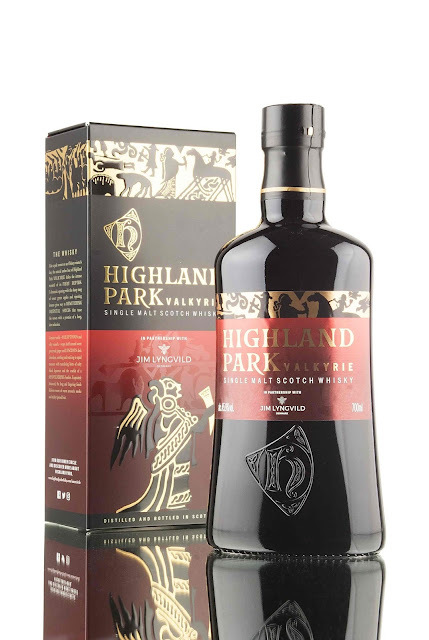 Definitely more peaty than the "normal" Highland Parks I've had so far, and definitely more peaty than the other three whiskies in the line-up. The peatyness seems almost toasted or medium charred. 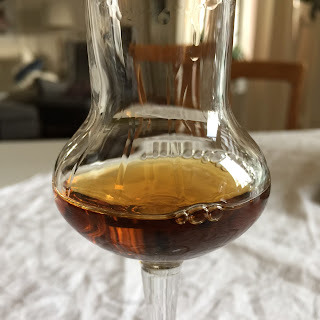 We have beautiful scents of dark oloroso sherry sweetness in here, but the interesting thing is that the sherry sweetness has an overtone of something citric (maybe something like lemon juice) and also very interesting some touches of watermelon (!) and salt liquorice. Covering/surrounding everything but the heavy peatyness is a beautiful heather-honey sweetness. Starts off very salty and quite vanilla-ish, but then "BAM! ", the peatyness hits, and oh boy the peatyness is spicy indeed. After the spice and peat mellows down we have a beautiful creamyness mixed with sun dried grass in a field, and also mixed with bitter salad/greens (maybe something like ruccola). The fruityness in this one is smoked and/or ovendried slices of pear, together with dark and sort of "smoked raisins". Very interesting tastes and flavours in this one due to the high peatyness, a very "different" HP because of this. Ends with a soft and rich touch of vanilla and citrus (mellow and not to citric lemon curd). produced for the Rebusfest and put away for charity auction. Big thanks to Martin for inviting me to the tasting and for making my Whisky-honeymoon even more special, Sláinte! The launch of Highland Park Single Cask no.3429 for Viking Line Cinderella!!! 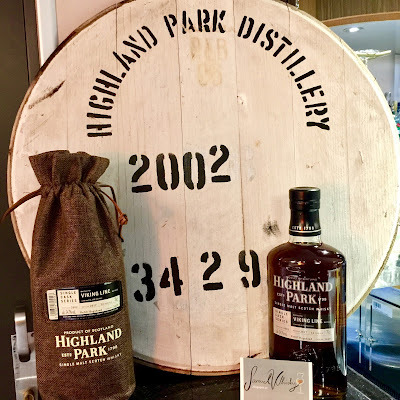 On the 17th of July, Dave Francis (Global Brand Ambassador for Edrington Travel Retail), announced on the FB-page ’Highland Park Appreciation Society’ (HPAS) that he, on the 22nd of September, would be launching the second Viking Line Single Cask on board the cruise ship/ferry Cinderella. Of course I booked the tickets for my wife and I as soon as I had read this great news! After what felt like a really long summer the day had finally come and we boarded the ferry early in the evening the day of the event. We threw our bags in the cabin and immediately went to put ourselves in line outside the venue for the event (Etage). Dave holding the hammer and the driver for the competition. Behind him a table full of SC! Around 30 people, mostly members of the HPAS slowly started gathering outside the venue. When the doors finally opened a sight for sore eyes met us; one table was fully set with a fairly newly released HP called Voyage of the Raven (travel retail exclusive), and another table was fully set with the SC that was the main character for the event! This is what I know about it from the presentation: 80 to 90 per cent of the liquid has been matured in first-fill sherry casks, a mix of both European oak and American oak (we were given no information about the ratio between them, and as far as I remember no info about the casks used for the other 10-20 per cent). The sherry casks used for this bottling have, just as for all other sherry casks used by HP, been seasoned with Oloroso sherry for 2 years before being filled with HP new make. 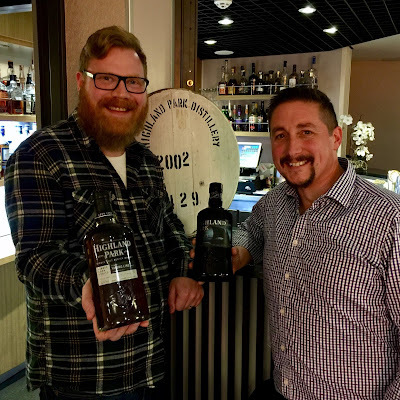 Dave also mentioned that one part of the liquid consists of their heavily peated recipe, meaning made only from their 45 ppm malt that has not been mixed with their “usual” 12-15 ppm malt, i.e. the recipe they end up with after mixing their 45 ppm malt with the 0ppm malt they order from Simpsons Malting. (We were given no information about the ratio between 45 ppm and 12-15 ppm malt in this particular whisky, and no information about the age and/or different ages used for this whisky). Sweet liquorice in combination with a mix of red dried apple slices and jelly pear candy, all in all with a touch of light honey (”hard” honey, not liquid). The peat, which is definitely stronger than in any core range HP I’ve tried, is slightly burnt in style. There’s a medium presence of vanilla, which is also slightly burnt. Starts of quite salty indeed! (This is probably due to the extra peaty-ness). The salt transitions very fast into a medium and quite compact peat intermingling with some ”exotic” fruit (subdued pineapple, peach, and oven dried apple slices comes to mind). Roasted almonds and burnt vanilla-infused cream is the flavour that sets the aftertaste in motion. Almond paste and a slight touch of dryness sets and end to the aftertaste together with a mix of honey sweetness and some burnt ashy peat. Given the high proportion of first fill sherry casks I am surprised to find no obvious signs of sherry on the nose or on the taste. I am definitely convinced that there are more american oak sherry casks in then mix than there are european oak sherry casks. Also, the 10-20 per cent in the mix that is not sherry casks is most likely bourbon casks. Voyage of the Raven is, in my world, a "simple" (not so complex) dram. 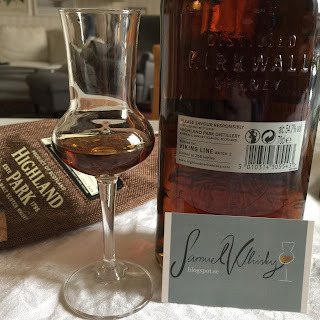 Of course there is nothing wrong with a "simple" dram, but given the high proportion of first fill sherry casks I had anticipated lot more signs of sherry and a wee bit more complexity, both on the nose and on the taste. The overall style of this HP is from my point of view best described as a ”simple and more than normal peated HP” and this is also what I will remember when thinking back on it. It is interesting that the peatyness is burnt and even ashy, and this is also what makes it special to other more “easy going” core range HP. If I were to compare this HP to other HPs’ of similar cost, I’d rank both Dark Origins and Valkyrie higher. If I want to enjoy a heavily sherried HP of similar cost I’ll go for Dark Origins, and If I want to enjoy a more than normal peated HP of similar cost I’ll go for the Valkyrie. When everyone had handed in their guesses for the competition, Dave introduced the new single cask bottled exclusively for Viking Line Cinderella. 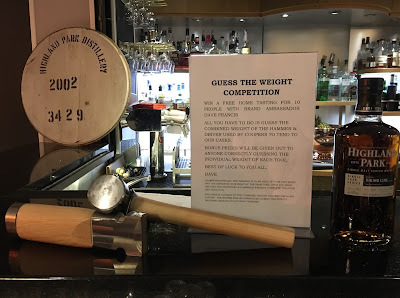 The cask number is 3429, and this time around the whisky has been matured in a refill sherry hogshead (please note that according to Martin Markvardsen, “refill” for HP means 2nd fill). I asked Dave if this particular hogshead was made from American oak or European oak and he told us that he sadly didn’t know. The reason for this is twofold: 1). Once the casks go from first fill to refill they no longer keep any notes or any record of the kind of oak. 2). 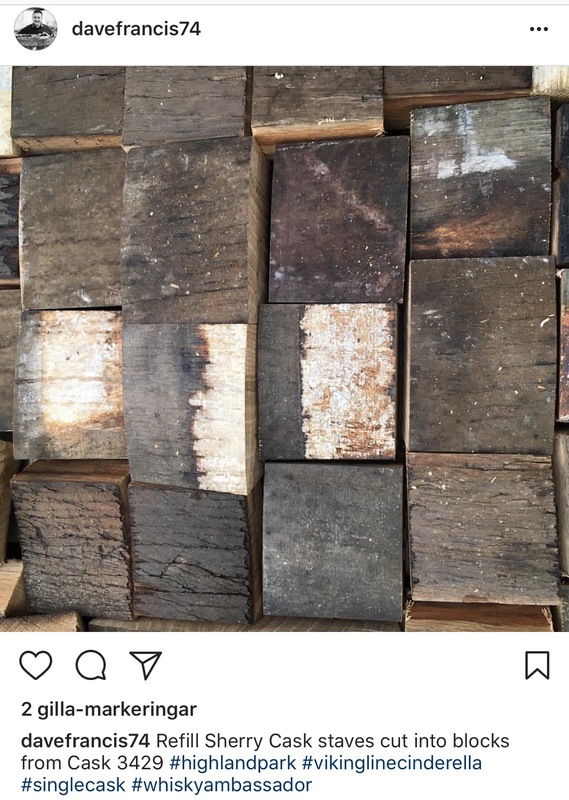 "...sometimes when repairing the casks some of the staves are replaced and they may not be from the same species of oak. Therefore we just state refill..." (additional info from Dave as a comment to my post in the HPAS FB-group). This particular cask was filled on the 22nd of August 2002. In an email conversation with Dave he told me that the bottling was done in September, but that the cask was “tipped a few days or a week before bottling” making the whisky “very nearly a 15yo”. 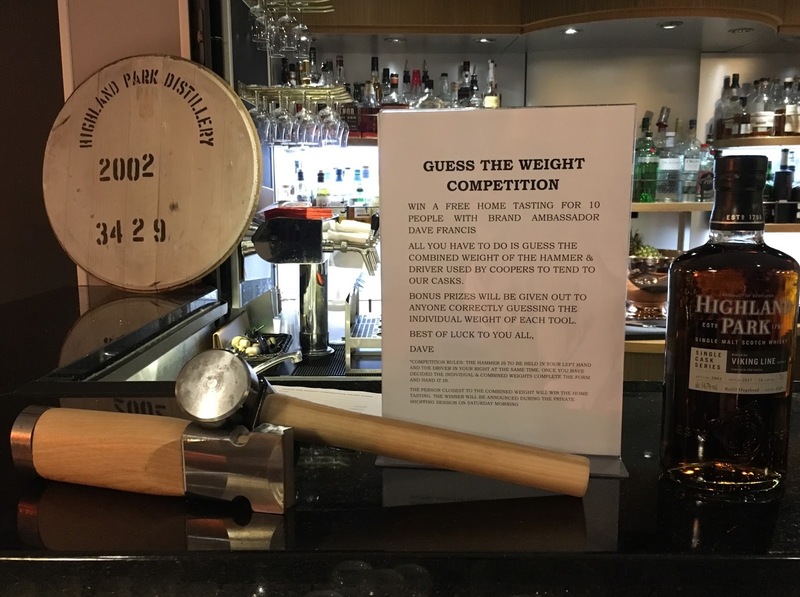 Hence, it is at least safe to say that the whisky was emptied from the cask before the 22nd of August ☺ The strength is 54,7% ABV and the cask gave only 258 bottles. The first layer is absolutely drenched with extremely dry and dark sherry! Every dried fruit you associate with dark fat sherry maturation is here to be found; dark moist raisins, dried figs, dried moist dates, and whatever else kinds of dried fruits you may associate with sherry bombs such as this one. There is also a very earthy and soil-y note going on, of course paired with a fat heather-honey peatyness. Actually, the peat is extraordinarily dark and earthy in this HP and has hints of salt liquorice, wow! The second layer is very rich on peel from orange but mostly drawing on grape peel, and the white inside of the peel is there too. This definitely contributes to the dryness of the nose. In the third and last layer, the very top of the register, there is an extreme acidulous scent, in fact it’s almost like vinegar and freshly squeezed lemon jucie, in some way being hold up by the dark moist raisins, wow! Mmm, this is such a great dram! Starts of on medium salty-ness combined with the vinegar (!) from the third layer, and in two seconds or so it moves on into a beautiful raisin sweetness, even overripe red grapes-sweetness. This in turn moves on into a beautiful fat or ”broad”, confident peaty-ness, wow! Then, after five seconds or so, there is a very interesting flavour of earthy vanilla fudge, even coffee flavoured vanilla fudge flies by in a whiff. The first aftertaste has slight touches of black pepper and the late aftertaste is dry, dry, and dry. The things that stay in my mouth at the very end is a dry earthy peaty-ness, dry vanilla and and a somewhat sour sweetness at the roof of the mouth. This must be european oak! Anyways, such an interesting nose, you can nose it forever. The taste shows perfect balance, and such great transitions between the different tastes, this is insanely good. This is absolutely one of the best Highland Park Single Cask bottlings I’ve had so far, it’s up there with the first one for Sweden (6403)! Wow, just wow! 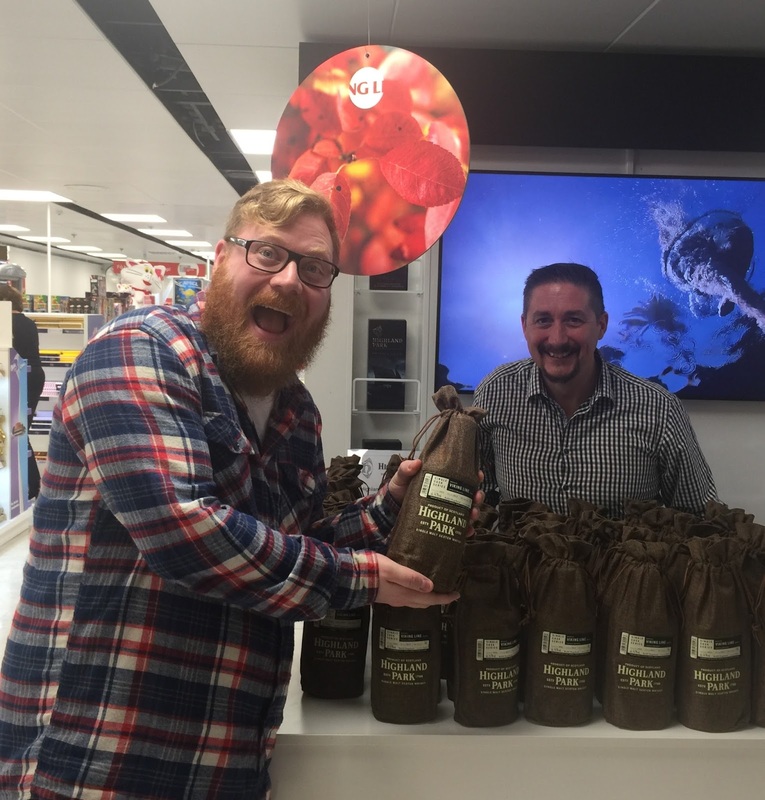 SamuelWhisky to the left and Dave to the right! After having tasted the single cask Dave mentioned that we were all very welcome to stay in the venue during the evening to enjoy 3 special HP-themed cocktails! 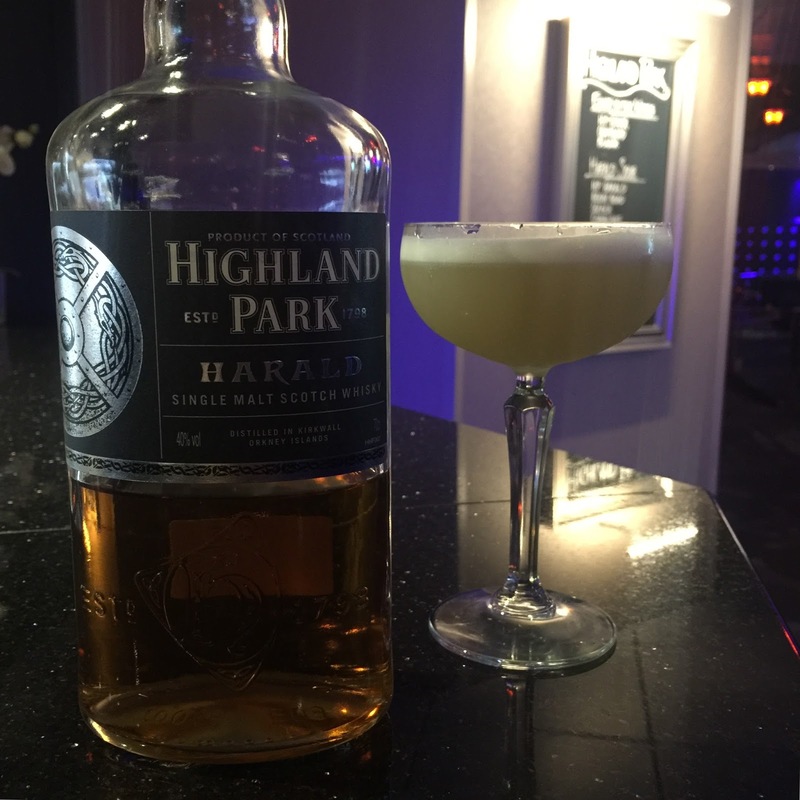 I enjoyed a "Harald Sour". A great experience to taste a whisky sour with HP in it! Yummie! 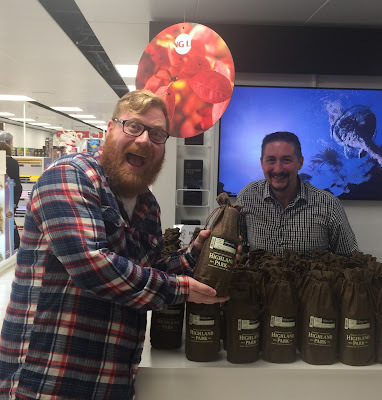 ...Dave told us to go on a treasure hunt; scattered around the shop he had hid a number of single cask bottles and if you found one you were entitled to purchase an extra! Very generous indeed! Also, for every bottle you picked up (I bought one) a piece of the actual cask used for maturing the SC was included in the purchase! So cool to see how deep the toasting level goes, and how deep the whisky penetrates into the wood! 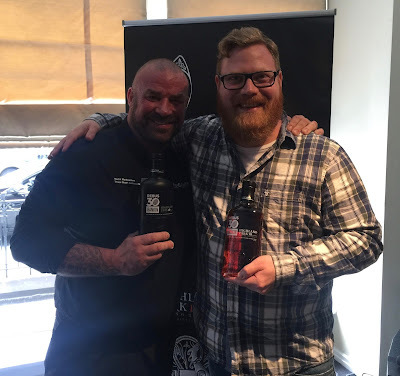 Big thanks and Sláinte to Highland Park and to Dave for a great event!